Thanks to my great friend, Gillian McIver-Tanbouli for directing me to this article. 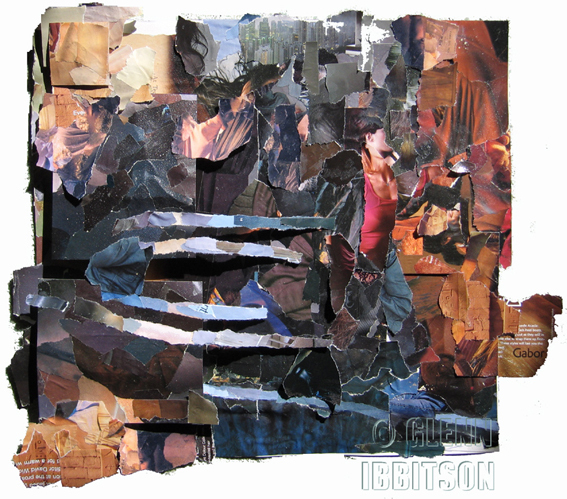 For some time now, I have been monitoring the condition of contemporary collage and its value within the field of fine art, with developing bemusement. Immersed as we are in an urbanised, multi-media world where all visual experience is cross-fertilised and montage is layered upon assemblage, the surprise is that in the fine arts, these techniques are seriously under-utilised. Apart from photography [and its progeny cinematography], collage is the only original visual medium sired by the industrial revolution. a by product of cheap, mass-produced printing, it was absorbed into folk art by Victorians, whose thematic, often sentimental designs were used to adorn firescreens, framed panels and book covers. It took Picasso to elevate the method to a fine art medium; a piece of oilcloth printed with a chair cane design provided immediacy of means ideally suited to further explore the terrain we now know as Cubism. 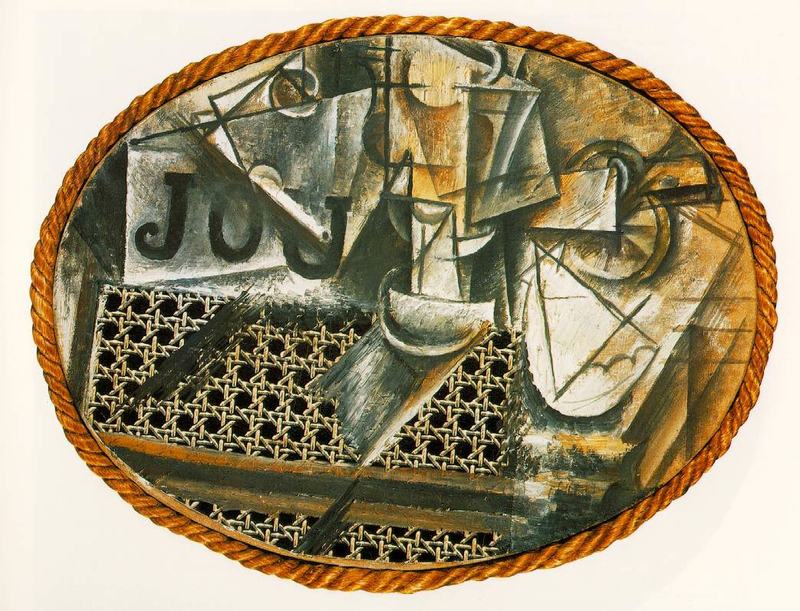 Yet while Cubism as a visual philosophy thrived, collage, central to its development, largely withered. It can be regarded quite justifyably as the great non-event of Modernism. 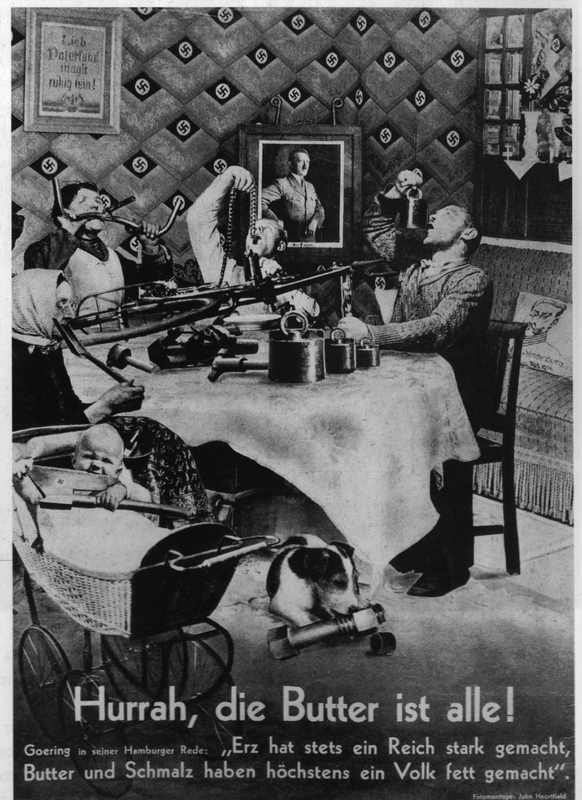 Notable exceptions of course can be found in the work of Heartfield, Schwitters and Cornell. Collage lent itself to the ethos of Pop Art and its cool [not to say cold], ironic use of industrial, commercially rendered imagery. This is a pretty thin paper trail through the vast forest of modernist imagery, though there are some rewarding fragments to appreciate on the journey. Collage could be so much more than this. Just because the materials are ready to hand, the artwork produced need not be crass. Lets face it the medium of oil painting is simply coloured mud and basic chemistry. Yet in the hands of gifted painters, it has been utilised to map and navigate the vastness of human experience. Is paper so resistant a material that only the very few can master the obvious discrepancies of scale and colour printing discordance between fragments? 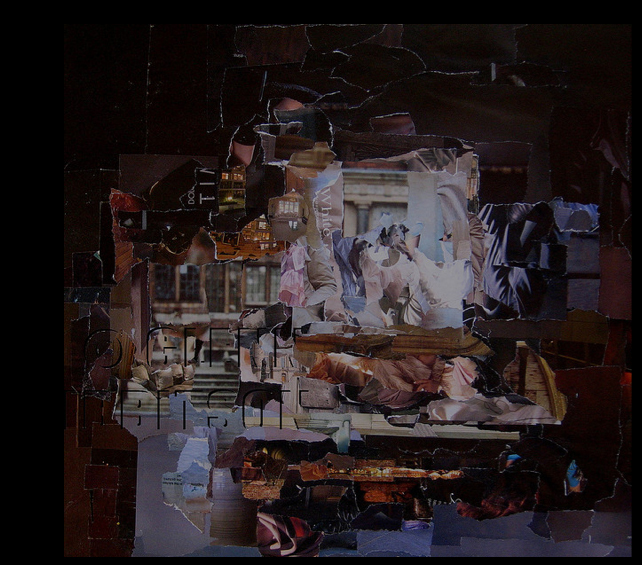 Is collage regarded as a secondary discipline because of a perception that it is not a colourfast material? If cared for and protected in the same way as watercolour, a collage should have a comparable life span. But of course, collage lacks the pedigree of ‘watercolour’; that venerable old medium of the gentleman [and ‘lady’] amateur. Collage is not underwritten by any corresponding cultural capital. 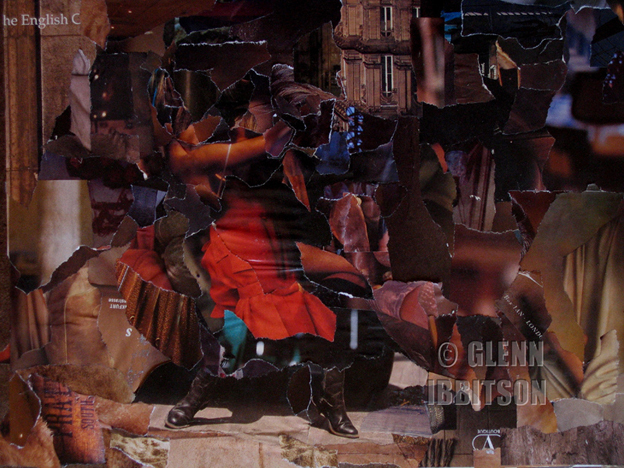 My own collage technique utilises printed fragments of urban consumerism, liberated from lifestyle magazines and rearranged in a new context. They are sometimes used for their value as image, as in a montage, and sometimes purely for values of tone and hue as in a mosaic. Often both functions are served simultaneously. Compositions build from ambiguous shadows and inconsistent shifts of focus, to create scenes of vague disquiet. I attempt to replicate that slightly unnerving feeling one experiences upon entering an unfamiliar space, where the first few seconds are spent rather anxiously scanning the room for something recognisable. In those initial moments, surveying a wide field of variable focus, certain textures and shapes assume an unwarranted significance because they may offer familiarity. Gradually, elements may ease into focus and begin to make sense in their allocated space. During the course of work, surfaces are constantly adjusted through a series of over-layerings; and areas of detail are more painstakingly constructed with smaller paper fragments. 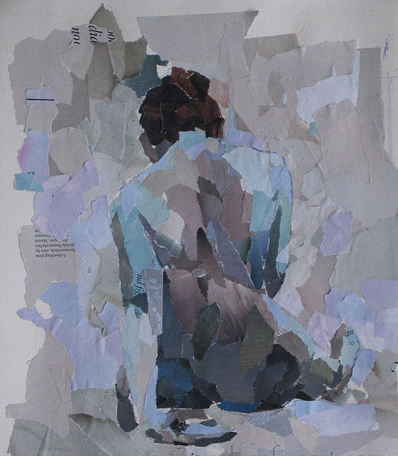 A unique characteristic of this form of collage is the variation in focus which one is able to achieve by combining the printed image edges with the physical tears of the paper fragment itself, producing ambiguities of form and space. 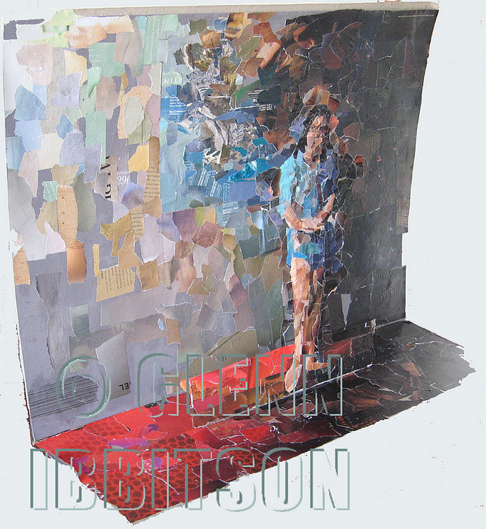 easingly, the success of a work hinges on one fragment of torn paper which provides that special intersection of textural or colour juxtaposition, not evident when originally embedded in the printed page. This elusive fragment cannot be manufactured: it is discovered and usually only by accident. Its incorporation represents the point at which the composition assumes a life of its own and deviates positively from the original plan. This suggests a reliance on chance; but here, chance is subject to decision and re-organsation. If the fortuitous combination does not work in the context of the composition as a whole, it will not survive. The medium itself always remains a secondary function to a primary conceptual thrust. Completed ‘papier colles’ may be shown as artworks in their own right or may provide source material for other paintings and drawings. Sometimes they are integrated in modified form into new collages. Until protected behind a glazed frame, they are never completely safe from revisions and modifications. Collage is, after all, a ‘Green’, recycle-able medium. 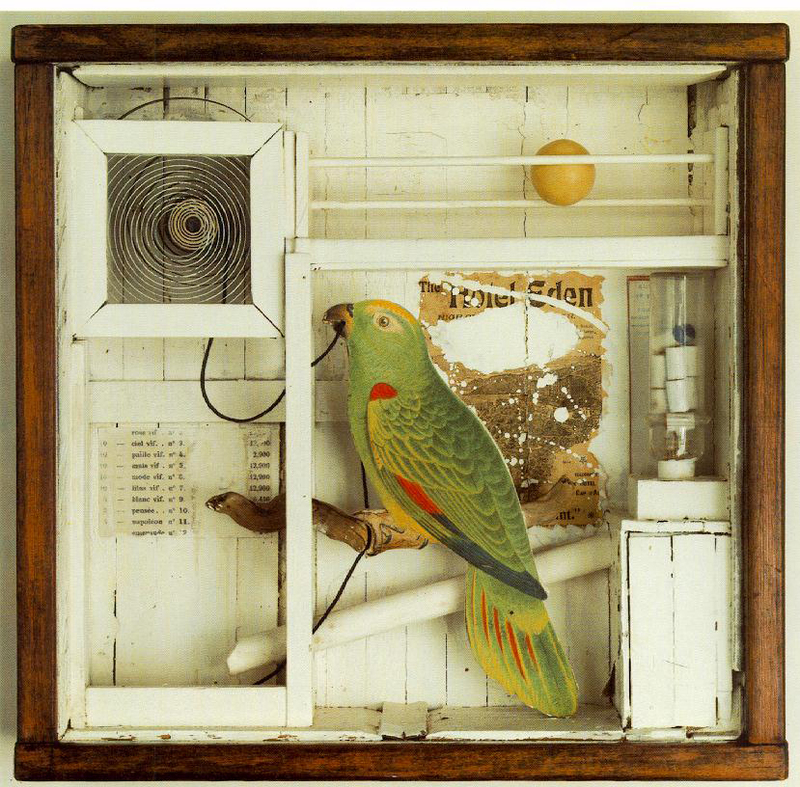 I would suggest a more central, serious role for collage in contemporary art. It may yet achieve status as a respected art medium, nearly one hundred years after a piece of printed wicker design should have changed the face of Modern Art, but failed….